Deposit of a ‘survey plan’ with Land Information New Zealand (LINZ). 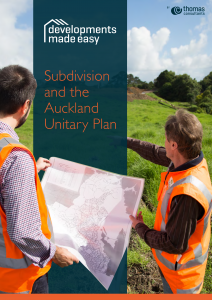 Typically there will be various professionals and organisations involved in the Subdivision process including Planners, Surveyors, Engineers, Lawyers, Council and LINZ. It is a detailed process but we can guide you through step by step to ensure everything runs smoothly. Our Surveyors are experienced in carrying out subdivision surveys for any size property. These can range from two lots (infill residential) to up to 400 lot staged developments (typically terrace housing or apartments). Find out more about the Subdivision process.